Leigh Ann’s book ‘Botanical Illustration – the complete guide’ has now been published. Full of information for students and budding artists, this book explains Leigh Ann’s own processes and methods for painting specific subjects and features a Case Study - a real worked example of a painting depicting the entire process of creating a botanical illustration. It also includes essential information about materials and equipment, drawing and painting processes, basic botany, colour theory, mounting and framing work and much more. Lavishly illustrated with over 350 images, this book is a complete and inspiring guide for all botanical artists. 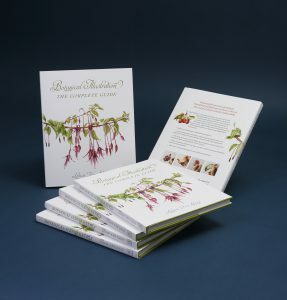 To celebrate the publication of her book, an A4 print of Fuchsia magellanica has also been produced. All book and print orders will be signed by Leigh Ann. Limited to sales directly through Botanical Art & Tuition.